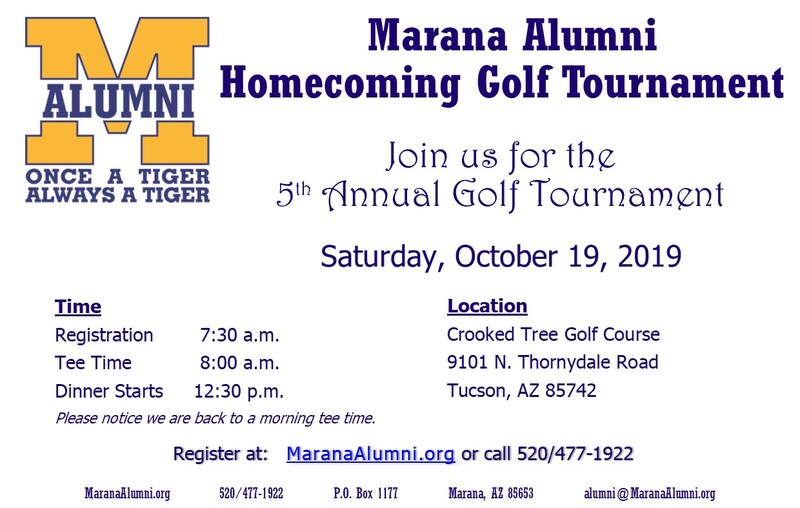 The Marana Alumni Homecoming Golf Tournament is on Saturday, October 19, 2018. Tee time is at 8 a.m. at the Crooked Tree Golf Course, 9101 N. Thornydale. Alumni, family and friends are invited to join us for golfing and lunch. Lunch is included for golfers. Alumni, family and friends can come socialize anytime and join us for lunch at 12:30 p.m. for $15. The easiest way to register & pay is on the form below. You can also use the links on the right to download the registration form and return it via mail, email or fax. Sponsorship opportunities are available and encouraged! Call 520-477-1922 or download and return the Sponsorship form with the link to the right.  Lunch begins at 12:30 p.m.
* Shirts provided if we have a shirt sponsor.